Lynn currently resides in Baltimore, Maryland. She has three grown daughters, Monique, Khristina and D'Anita and four granddaughters, Taylor, Cierra, Shawntae, and Shawna. She attended Coppin State University, formerly Coppin State College, where she received her Bachelor of Science degree in Biology. Currently, she is working as a Sr. Research Program Supervisor at Johns Hopkins University located in Baltimore, Maryland. As an active member of Providence Baptist Church, she is the coordinator of the Visionettes Liturgical Dance Ministry (children and youth between the ages of 3-18) and the Ministry of Dance (adults between the ages of 19-50). In addition, she is a Girl Scout Leader, a member of Bible Study for Today's Living Sunday School class, the Board of Christian Education, and the Psalmodists of Praise Choir. She is also a member of Restoration Dance Ministry which is a community based liturgical dance ministry and a partner with the International Liturgical Dance Fellowship located in Baltimore. Lynn loves the Lord and loves to teach children about the Lord. I Have Two Daddies is the story told by a little girl about her two daddies, her earthly daddy and her heavenly daddy. As she talks about her earthly daddy, she talks about all of the things they do together. She describes the things her earthly daddy does and says to assure her how much he loves her. She also tells of her heavenly daddy, the daddy she can’t see because he is in heaven. First she tells how she began her relationship with her heavenly daddy, and then about the things that assure her that her heavenly daddy loves her. Join this little girl as she tells you all about her two daddies, and how you can have a heavenly daddy too! I really like this story. Having a little girl tell the story about her earthly and heavenly daddies was a very nice idea, because children will listen when other children tell them something. I like that the two daddies are compared to each other, and author Lynn Calvin does an excellent job of explaining the likes and differences between the two. And the illustrations by Maria Rask are well thought out and fit the story well. Other neat things in this book is a Praise Certificate, to fill out because you are thankful for having two daddies, as well as a few activities for children to do. It would be wonderful if this book could get into the hands of every child. I highly recommend this for your child’s library. A recipient of the Mom's Choice Awards! 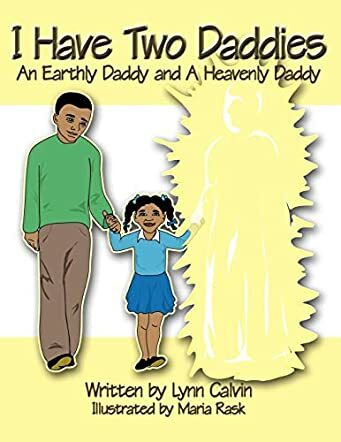 The story, "I Have Two Daddies" by Lynn Calvin, is an easy-to-read story explaining the parallels of the earthly and heavenly fathers. It is written in a style that young children who are beginning their Christian journey can understand. It also reassures children who do not have an earthly father that someone cares for them. Small children who must have the story read to them will have no problem remembering line for line after several readings so that when they are "reading" alone, they know exactly what each page says. I would recommend this book for all young children. THIS BOOK IS AN EXCELLENT READ FOR KIDS. LYNN CALVIN HAS SET THE BAR FOR CHILDREN THAT HAVE AND DON"T HAVE BIOLOGICAL DADS TO UNDERSTAND THAT GOD WILL BE A FATHER TO THEM REGARDLESS OF THEIR CIRCUMSTANCES OR SITUATION. THE ILLUSTRATIONS WERE BRIGHT AND VIVID! I WOULD RECCOMMEND THIS BOOK TO ALL CHILDREN!